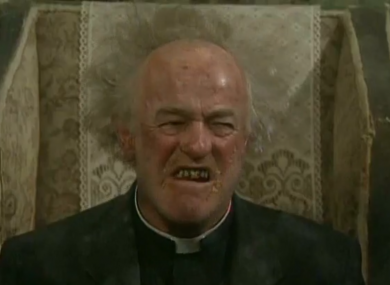 ORGANISERS OF THE official Irish hospitality area at the Olympics have played down reports it will be Father Ted-themed – saying that only part of the venue will be based around our nation’s favourite drunkard Father Jack. The Irish Olympic House aims to be a “magnet” for Irish supporters, athletes and others, based in a multi-floor bar venue in Kings Cross. It is being commissioned by the Olympic Council of Ireland and run by events firm THG Sports Tours. It will feature a basement area called Father Jack’s Bar which “reflects the whole atmosphere of Craggy Island,” a publicity spokesperson for the House said. But she said earlier reports that the whole venue would be Father Ted-themed were inaccurate. The spokesperson also rejected suggestions that basing part of the official Irish venue around a show featuring hard-drinking priests could be seen as inappropriate. It’s a small tongue-in-cheek area. We’re not saying this is the same as Father Ted. It’s not going to be the first thing people see as they walk in the door. She said the decor includes trees growing out of the bar, and retro wallpaper. The area was designed in collaboration with the writers of Father Ted, she added. It’s designed to replicate that feeling that you get when you go out for a night in Ireland – it doesn’t matter where you go, who you see, you always have an amazing time. We want to replicate that. The Irish Olympic House will also feature live concerts, a roof terrace, a ‘tuck shop’ selling Irish food products and a VIP area. “We want the Irish Olympic House to be the No. 1 party destination at the Games,” said James Sinton, CEO of THG Sports Tours. We feel a strong obligation to cater for Irish people travelling to the event to support Team Ireland and to the Irish community in the UK. The Irish Olympic House will undoubtedly be a magnet for our supporters. Email “Father Ted-themed bar ‘just part’ of official Irish Olympic venue”. Feedback on “Father Ted-themed bar ‘just part’ of official Irish Olympic venue”.